BlackBerry spilled some pricing details about its new Z10 and Q10 handsets, running BB10, saying that these will be available on Canadian carriers February 5 starting from CAD 139.99 for the typical three-year contract there, which will likely translate to $150 in the US with 2-year shackles, if the rumors hold water. The company had one big surprise in terms of availability, though, and it is that UK carriers are starting to take preorders as soon as tomorrow for the BB10 flagships, and we are now seeing the first pricing schemes across the pond. 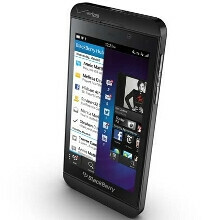 EE, O2, Three and Vodafone will all be offering the Z10, as well as major shops like the Carphone Warehouse and Phones 4U. Carphone Warehouse, is stocking the Z10 for absolutely free with a £36 a month or more contract on all carriers, while Phones 4U announced that it will exclusively have both colors of the handset, but hasn't specified a price range yet. Free handset for Vodafone starts from the £47 a month plan, you will pay £29 for the Z10 on the £42 a month Red Data plan, which has unlimited calls and texts as well as 2GB of data, while the cheapskates can get away with £69 upfront for the handset and a £37 a month plan. The Z10 has an LTE radio inside, but right off the bat it can start utilizing only Everything Everywhere's 4G network only for £50 on the £41 monthly plan for two-year contract and 1GB of data. Three UK and the others haven't disclosed their pricing schemes yet.